The new Buzzsaw XL, extra length, glides through the midlane, saving all it’s energy for the backend. With the combination of our patented diamond core and the XL coverstock, this beautiful midnight blue pearl Buzzsaw XL will dazzle your eyes, as well as the pins, on tougher drier conditions. Ball has a 3in. pin, drilled from axis point with 4 1/2 by 4 1/2 with an offset thumb. Rolled this ball in different breakdown conditions. First shot was heavy midlane and backend carrydown, ball rolled smooth through the heads and maintained long length with plenty of power to explode the pins even through the heavy oil in front of the pins. As this shot evaperated I went as deep as 6th arrow and the ball still held to a true roll and flip to the pocket. Second condition was a faster breakdown of the heads and the midlane while the oil didn't carry down well, but evaperated all I did was less turn on the ball to create longer srtoke, deep inside shot and let the ball do what it was made to do. This is my 3rd Buzzsaw and might I say that I am very satisfied with all of them. This ball goes through the oil and suddenly changes direction. I use it on synthetic lanes and it does well. Very versitile: can strike from inside or outside or can go for either of the corner pins. Not as good as I had hoped for though. Not quite dry enough for a dry conditions ball for me. Also it doesn't have the area I expected. I drilled one of these balls for one of my customers who is a Buzzsaw Fanatic. John is a lower rev tweener player, but pretty accurate. His track is a little low, getting the ball down the lane is not usually a problem. Getting the ball to turn the corner when the lanes break down is. He loves the Cherry Carbide/C. He wanted the Silver Buzzsaw/C, but this ball had just arrived in the shop, so we drilled it. I used about a 4 inch pin from PAP with cg in a strong position, and the mass bias in about a 75 degree position. I wanted this ball to make a sharp turn when it does make a turn. So when John has to move to 3rd or 4th arrow (not in his comfort zone) he can get the ball to turn the corner. This ball was perfect! There was a tournament in town that weekend. First 3 games right out of the box - 737. He was bowling second shift of team event on somewhat broke down synthetic lanes. The XL was easier 10 boards longer than the Cherry Carbide, but much sharper. He went from 1-2 boards area at his break point to having about 6-7. For John, this was the whole lane. XL hits very good. Only 1-2 10 pins in the set, in a house noted for not carrying the 10 very well. He left two solid 9 pins, which doesn't happen for him very often. I think this ball will work well for the big hand guys. For the straighties and tweeners, this will be a dry lane ball. I think the twisters will really like this ball with the pin over the fingers, stacked. From 4th, 5th arrow, this ball should have plenty of energy on the back end. Compares to a strong Storm Too Hot, or maybe a strong Messenger Pearl. Probably a little harder at the break point than these two balls. Fairly long for a Brunswick produced ball, and cover material shines very nice. Compares to the Zone X shell, but the ball gets down the lane a little better than a Zone X. Hope this helps ya..
for a 630 first week and 607 second week.Also during practice this week I rolled 4 games 237,205,300, and a 247.I am very happy with this ball.I plan to buy a Carbide next purchase.My game just keeps on improving. Too Hot, no. Flame, no. Tornado, no. Scout, no. If you have alot of hand please break down, spend the extra money and buy this ball. I wasted money buying other dry lane balls, instead of just buying this one first. We all have done that. But hopefully I learned my lesson. deep in and dry mids and screaming back ends. Passed with flying colors. I drilled this ball to go super long. This ball clears the heads excellently. You need to hit some dry, but when you keep it in the soup it does not leave puff corners like other "dry lane" balls. The drilling being 6x4 you need that dry. This drilling might even be to extreme for it. I need to experiment with it more. The XL hooks about ten boards less on a normal house condition than the cherry c2. This ball will make you want to practice on scorched shots. I cannot praise it enough. Buy the ball, drill it right and go find some dry!!!!! Drilled this ball a form of leverage with 3and 3/8 from pin to pap, pin to right of fingers. This ball carried 100% of light hits, for about 7 games, it hits very much harder than most dry lane balls as I had momre 9 pins, and 8 pins than 10 pins. I expect this ball to be a killer for me as I loved the original buzzsaws...I am definitely back in the Buzzsaw camp and may try the Carbide LRG soon. Ok I am back after first night of league, This ball has amzing carry. In my mens league I only had one 9 count all night an it was a high hit leaving a 3 pin..NOT ONE SINGLE 7 PIN, 10 PIN OR 4 PIN!! DEfinitely a ball I would reccomend!!! As my name suggests, I'm a Brunswick fan!! So I had a little reservation when I purchased the XL. To start with I drilled the XL with the leverage drill pattern provide on the lane 1 website. The ball goes longer than most of my brunswick balls but the hit this ball has is tremendous. I tend to leave alot of corner pins with other brunswick reactives but to my surprise the 9 pin was tleft more than the ten my first league night with it. I'll be looking for a stronger-roll earlier buzzsaw in the future to compliment the XL. Great ball a little expensive though. After having the opportunity to throw the XL on a couple of different oil patterns I decided to post a review on its progress. The ball stats are as follows: Weight, 15lbs 4 oz. Just about 3 ounces of top weight. I purchased the XL to use on dry lane conditions, it was advertised as a ball that achieves great length, and gets through the heads with ease. I was struggling last Thursday night with my Pro purple, it was hooking to much on the shot that was put down so I pulled out the XL. First of all I need to mention that I drilled the XL 6 x 4 with the addition of finger weight, most people thought I had lost my mind putting an even longer set up on a ball already designed for extra length. I moved outside and played the first arrow right down the gutter just staying out side the soup, the XL did roll long, very long, then set up on a descent towards the 1-3 like a well oiled machine. Playing the out side line brings with it a great many disadvantages if you don’t stay focused, you can also leave a lot of ten pins. The XL rolled out to about 50 ft then made a very defined readable move with a great deal of force just blowing the rack apart. In practice I tried several different lines, I moved in and played the 3rd arrow out to about 8 but left a lot of ten pins, I moved back over and played the second arrow with the same result. So given that I moved back out side to the 1st arrow with good speed and exceptional results were gained. Keep in mind I have used this ball on fresh heavier oiled medium lane conditions, not the condition I should be using it on, when the lanes dry out I know I will be able to move left and finish very strong. I have however read reviews where the XL was set up with an aggressive drill pattern and people were very happy with the predictability, and power of the ball. In my experience with all Lane one balls that I have, they all hit and carry so well I will never use any thing except Lane one. This is the first reactive ball I have ever thrown, it’s a winner. Thanks Lane one. First I want to say that this is my third year back bowling after a five-year layoff. First year back, I averaged 181 with a Columbia Extreme Chaos. Using the same ball, I averaged 193 last year. This year I moved and changed bowling alleys. The Extreme Chaos seemed like too much ball for the line I like to throw and I was struggling with a 188 average so on the recommendation of a good friend, I decided to try a Buzzsaw XL. For the first nine weeks I still struggled with the Buzzsaw XL (I couldn't get it to react the same way twice it seemed) and averaged 188. On a whim one night, on the last game I decided to try a different release. To my wonder, I bowled a 267. I've been bowling using the same release for the last ten weeks now and have been averaging 210. I basically throw straight down the 2nd arrow, the ball goes down about 45-50 feet, and hits the 1-3 pocket REALLY hard. Very few ten pins (about the only time I do is when I hit a little right of target and the ball comes in at a little steeper angle…which is to be expected). I highly recommend this ball although you might need to make some adjustments to your game to make it work. Fantastic ball. Carry is unimaginable and unexplainable. Hands down best medium to light oil ball of all time. Only thing I need to worry about with this ball in play is booking 240! I have had this ball for two months now. 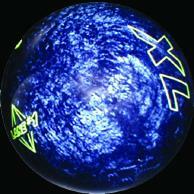 It is a great ball it works well on drier lanes but doesn't go long to be great on really dry lanes. This ball hits very hard and carries great. It gets down the lane and makes a nice move back to the pocket. I was amazed it only took 4 games to create perfection, first one in 2 years. I"m definitely keepin this ball. "PUNISH THE PINS All 9 of them"
Ball is 16lbs, 2-3" pin out and RE-drilled (5x4) pin under the ring finger CG kicked out and inch. The previous pattern on my XL was over undering on alot of conditions I faced, plus the carry was terrible, worse than ever before. So I paid for plastic surgery and had it redone. The new layout is terrific for medium to lighter patterns like it should be. The ball rolls smooth, even, and controllable down the lane. It gets through the heads just as easy as it did before, but the CG out sets it in a roll sooner to prevent violent jerky backend reactions. The hit and carry are typical Lane 1, which is even better now than before. It doesn't hit as hard as the Super Carbide does, but it still hits pretty damn hard. Typically I use this Buzzsaw on second shift or light oil tracked out patterns. I usually line my slide foot on 25 and push the ball out the a break point of ten. On the condition it's desgined for there is a superb predicatability you can count on frame after frame. I can play this same line on either lane surface. Just to think I had retired this ball and at one point wanted to sell it based on it's performance. Now I really like it alot as it fits my style better and use it as much as I can during competition. I drill this over a year ago for a shop guy that like to turn it up. I ordered a pin in and put the CG and Pin on his grip line, which is about 5 1/2" for his axis. He used his ball in two leagues, one was second shift and the other was a first shift fresh oil. The first night out was on the second shift, and the bowler found it too hard to control because of the backend. The ball was clean through the front and make a strong arcing motion at about 40 feet. One the fresh shot, this ball was awesome. This more head oil and midlane oil the ball was able to get down the lane further and make a smoother move to the pocket. This is a strong pearl ball, and less overall hook than the Emerald Buzzsaw C2. 14# Buzzsaw that just did not impress me that much. Drilled label. For some reason this ball did not hit as hard as other buzzsaw's to include the pro purple which has the same core. This is the only buzzsaw that has not fit into my game. To rate this ball bad would be an injustice to a great company. Others have great success with this ball and love it.